PES university conducted ‘Conquiztador 2018’ on 12.7.2018. The following are the winners. 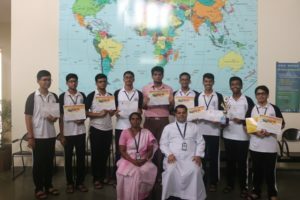 St Aloysius College conducted an Intercollegiate Mathematics Fest for PU students on 1.8.2018 . The following students won prizes. First Prize: Shravan Singh Mehra of XII A in Mathventure. First Prize: Ayush G Rai of XII B in Mathprix. First Prize: Ankush Moger of XII B in Mathlantic City. First Prize: Samarth M Bhat of XII B in .